A Kaduna-based non-governmental organization, Mobilizing for Development (M4D) says it is breaking new frontiers in its quest to share ideas and best practices of the organization’s work with more Community Based Organizations (CBOs) and policy makers other than its franchise areas as a means of improving good governance in Kaduna State. The objectives of M4D at a get-together like learning event include to demonstrate to non-M4D CBOs the process of organizing, engaging and influencing as a means of improving citizens’ access to effective service delivery and to develop an action plan that will guide them on how to implement what they have learnt from peer review. A participant, Mrs. Justina Bakut from Jabba LG said that, she has been well equipped especially on networking with other CBOs to echo their voice better and attract attention of policy makers right from budget planning to its implementation in order to ensure that only the needed projects are executed by the government. “Before now, I don’t know anything about networking. I usually thought an organization can work in isolation without joining hand with others to share ideas on how to move forward. I think an organization can work based on what its members think is good for them not necessarily asking from others. So, this learning event has taught me so many things I don’t know despite been involved in the organization for a long time. For example, there are places that don’t have water and even as we speak during hash weather condition like dry season, their river and well are already dried up and that means they have to trek kilometers before they can get water. These people are suffering. So these people need borehole or even pipe borne water which has even become scarce. Sometime the water board people will come and disconnect people who may not be able to pay their water bill even though the water is not frequently supplied. So we have learn the best way to go about all these issues without confrontation or force and the policy makers will reason with us”, she added. Another participant Umaru Samaila from Kachia said, “today I leant how to write demands and show the evidence of writing such demands. If I get back to my community, I will mobilize my people and tell them what I have learnt here and see how we can do better on what we have been doing because there is always room for improvement”. In an interview shortly after the learning event held in Kachia on Monday, State Programme Manager M4D, Hannatu Ahuwan, said she considered it a learning event rather than training event because her NGO is working with Community Based Organizations (CBOs) in three local government areas of Kaduna State which are Kachia, Igabi and Kudan, a five years programme and which according to her is gradually coming to a close. She maintained that, M4D did not want to limit the scope to only the three LGAs where it is currently working, but want to see that even other CBOs in non M4D wards can also learn what its CBOs have learnt from; how they have leant it and of what benefit is this training to them and their communities. Giving insight into her organization’s activities she said, “the essence of our organization is to see that policy makers and service providers are more responsive and accountable to citizens needs and entitlements most especially those of excluded groups. So in other to achieve that, we work with LGA itself while we also work with CBOs to see that they are better organized and they are able to mobilize their communities, identify their communities issues, prioritize them and then make demands of their policy makers and service providers. We have been able to teach them certain things and we have improved their capacity. So we are here to review and learn more on all these things they have learned including other CBOs from other LGAs even though we are not currently working there. Like I mentioned earlier, we are working with already existing CBOs and there are criteria we used in selecting them. They are already known by their communities and that means they have been doing one thing or the other to improve their lot. So we carried out assessment need to identify where they have gap in term of organization and then strengthen their capacity in different ways and we have been able to achieve that. Some of them don’t even have structure in place; no constitution, no action plan and some of them are not even inclusive as some of them don’t have single woman or people living with disability among them. All these bottlenecks we have been able to resolve and they are doing fine now. Now, we are happy that they are now doing what they hitherto don’t do. For instance, they identify their community needs and present them to policy maker in a manner that it will be difficult to ignore. They start with their LGAs and where the LGAs may not be able to handle such needs, then the state will come in. They also provide feedback to their community there by carrying everyone along in their activities. Within this senatorial zone which has eight LGAs including Kachia where we are currently working, from each of the seven other LGAs we invited three CBOs and each of them came with two representatives and their community development officers of their LGA. So that translates to 49 of them apart from other CBOs we are working with. The message we have for them is that, they should go back to their various organizations and communities and put into practice what they have leant in this extensive learning event. They also need to get their CBOs better organized as they can see from those we have already trained. 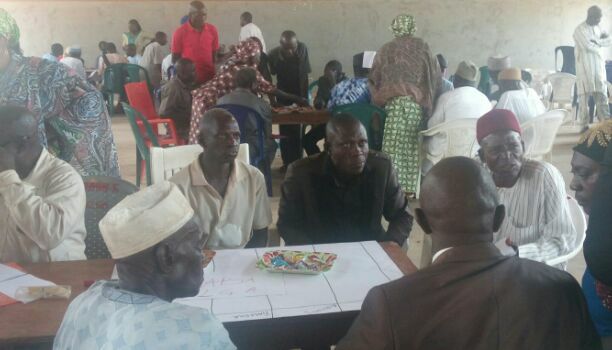 Now they can better mobilize their community, identify their needs and then approach policy makers and service providers to their advantage”, added the state programme manager for M4D.